The Benton County Skateboarding Alliance (BCSA) is holding a benefit show at Cloud & Kelly’s downtown. Almost six years young, the BCSA has been recently dormant. This show will rocket them back into the summer scene and help build momentum leading up to their August Skate Jam. The BCSA is raising funds to grow and improve the Eric Scott McKinley Memorial Skate Park. “We want to improve the skate park by building a bigger, pro-style pool,” said board member Jon Musch. The 591c3 NPO has a grand, long-term vision of expanding the current park as well. 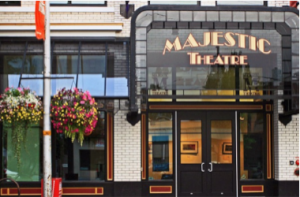 They hope to include new skating terrain and support facilities such as benches, picnic tables, BBQ facilities, restrooms, lights, signage, and landscaping. They want to make a world-class skateboarding destination that is still family friendly. They are also exploring the possibility of constructing new skate parks around the county in places like Philomath. McKinley Skate Park is located near the fenced dog park just south of downtown Corvallis under the overpass at 1st and B Street. 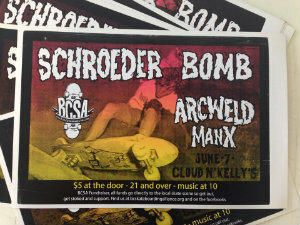 The BCSA Benefit Show will be held on Saturday, June 7 at 10 p.m. at Cloud & Kelly’s, 126 SW 1st Street. Cover charge is $5. This is a 21-and-older show. 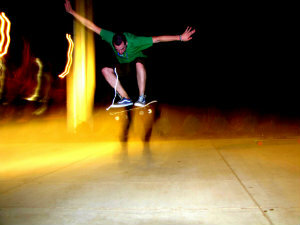 For more information, see the Benton County Skateboarders Alliance page on Facebook or visit www.cloudandkellys.com.